Food is an integral part of any party, and both children and adults look forward to a delicious dessert at the end of a party meal. But why insist on a traditional cake for a children's party, when there are so many exciting and unusual puddings to choose from? Here is a selection of desserts that are both fun and easy to make. Slowly melt the cut chocolate in a bowl on the hob, preferably over a double-boiler (you can also use a heat-resistant bowl, such as Pyrex, over a saucepan of boiling water). Stir while melting, and take care not to overheat as taste could be impaired. Have children thread fruit and marshmallows onto skewer. When chocolate is ready and warm – not too hot – pour into large bowl. Allow children to dip skewer into bowl one at a time, then eat and enjoy! 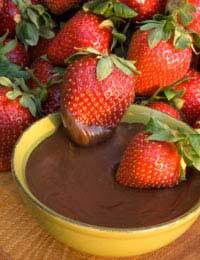 A less messy option is to hand-dip strawberries into chocolate beforehand, carefully holding each one by stem. Lay on baking paper on plate and allow to harden, then serve as a delicious and healthy dessert both kids and adults will love. Prepare jelly according to instructions on box. Put into shallow baking pan and leave to set in fridge (this usually takes four hours at least, so make sure you plan accordingly). Press biscuit cutters into jelly, sliding a flat knife underneath so they don't fall as you transfer them to plate. Hint: You can always use sugar-free jelly if wanted, and can also find jelly without animal-based gelatin if you or your guests don't eat meat products. Prepare cake according to instructions, which will require eggs, vegetable oil and water. Bake in a 9in by 13in pan, then cool completely. Remove ice cream from carton in one piece. Using a piece of string, cut ice cream in half lengthways. Place the two pieces of ice cream on waxed paper. Place cooled cake on top, then cut and trim so you have two identical pieces of cake with ice cream on the bottom. Layer together carefully so you have a cake with two ice cream layers (with cake on top). Cover with waxed paper and freeze. When ready to serve, ice with ready-made icing, decorate with fruit or sweets on top. This is fun for a teenage girl's party, or one with a Hawaiian theme..